Just looking through the latest Sieg catalogue and they list different feed units for the standard and Long tables. I think Axminster only do it for the standard table as they don't do the long bed machine. I'll check mine out sometime soon. Have had a look at the thread you linked to; will read it more thoroughly soon. I did notice a photo of a beautiful piece of machining by yourself in the thread. Wow... you are correct. I'm glad you flagged that up, otherwise it might have been an expensive mistake! Doesn't look like one can order direct from Sieg. I may not go down the power feed route anyway, just weighing up possibilities. Probably best to fit the DRO then see what I'm left with. Bangood are not a supplier like Chronos. RDg, ARC etc but just a market place like e-bay, Amazon, etc so you are not always going to get exactly the same item as they list quite a few 50mm face cutters. Depending on where they actually come from they may be rejects sold on at a discount, walked out the back door in someones lunchbox or reasonable ones sold at a low price for various "money" reasons. So it is a bit pot luck what you get. I was not given mine so happy to say what it was actually like. The Feed unit is narrower than the 2.7 table and the adaptor blocks that house the clutch all seem to be made to the table width and replace the black end plate so should not stick out beyund the back edge. I don't know why the long table should need a different unit, if you do decide you want one Ketan may be able to special order for you but Sieg are on a long delivery leadin time at the moment. Will post here on how it goes. If I do decide to check out the power feed more fully I'll have a chat with Arc about it as you suggest. That's a nice new mill Gary. Similar to my import mill. I found I had to do some measuring and set up on both my lathe and mill to get them square, trammed and true, but after that bit of effort, plenty good machines. Looking forward to seeing you make chips with it. The face mill is an excellent idea, I'll keep that in mind, I may well want one of those. Stuart - I haven't tried the facemill yet but if by any chance you are thinking of buying one from Banggood, see Jason's comments higher up in this thread. A little bit of progress this evening after a major episode of DIY in the house. Apologies for the somewhat fuzzy picture. I'll carry out the test at the weekend. The cap and chimney are not yet silver soldered together - the chimney is resting in a circular rebate which I cut around the central hole to approximately half the thickness of the cap. My idea is to give the silver solder somewhere to flow into. Any advice anyone can offer on how to silver solder brass without ruining it will be most welcome! The photo below shows a close-up of the water level gauge. Fitting it was easier than I expected, though I won't get too cocky until I have seen it not leaking under pressure. I had to make a 1/4" to 5/16" adaptor for the top bush due to a mishap back when I was silver soldering the boiler. It seemed to work ok, but time will tell. 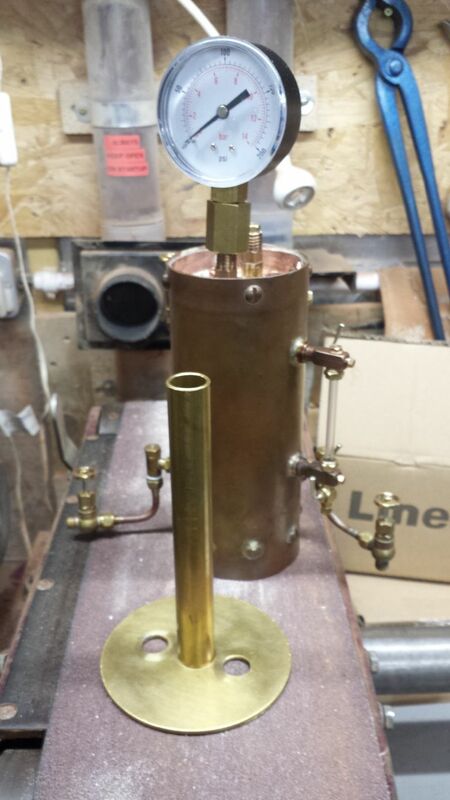 Looking good Gary, the water gauge looks to be a better quality one than is often seen on small boilers. I have a boiler kit waiting in the wings. I hesitate to work on it because I know so little about them (and they are bit dangerous). The water gauge for example is something that I've always wondered about. The glass is under the same pressure as the boiler, right? Or not? I don't mean to hijack your thread, Gary. Your thread...like many other members' threads is excellent learning for me. I have a boiler kit waiting in the wings. Carl, which kit is it that you have? 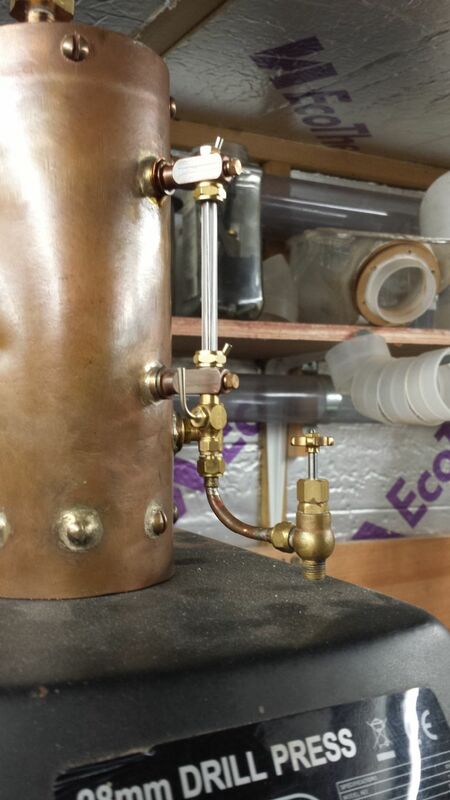 I want to try and make a small boiler before long, I was intending to use 3" dia copper tube that I already have but have considered building from a kit. It's the BLR-1 from PMR. Another reason for the hesitation...I kind of like/prefer the horizontal boilers. So it's been difficult getting excited about this one. Bad Behavior has blocked 16628 access attempts in the last 7 days.